could save your life...or kill you. ​Caregiving is dangerous work, and it changes you. As my mother’s primary caregiver in her final eleven years, and subsequently a hospice chaplain, I understand the life and death stress of constant vigilance, interspersed with long periods of daily tedium. 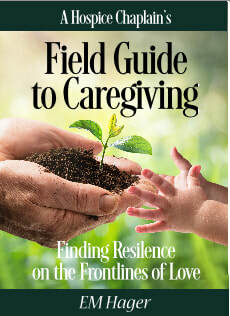 The Hospice Chaplain’s Field Guide to Caregiving are my rules and gifts to you. It is a compendium on the cyclical nature of sorrow and the bridge to the next right thing. Joy will come around again; it’s possible to shift to healthy survival in these caregiver trenches with a few gentle gifts. It is even possible, here, to have vitality and renewal. It is my hope that these thirty-one gifts will support you and renew you in this best and hardest journey anyone may walk with another. For the most recent reviews, please see the Field Guide's Amazon page.